About Lisa Rusczyk Lisa Rusczyk is the founder of Charlie The Cavalier (a blog about Charlie her dog, and her friends, family and home) and founder of 50ThingsToKnow. Lisa is a Doctoral student in Educational Leadership who happened to start writing her first book 50 Things to Know Before Having a Baby after her little girl was born. Her book sold over 1,000 copies in the first year on Amazon. Today, she has over 10 books and helps others self-publish. Further, she shares this information with the public via this blog, Facebook, YouTube, Pinterest, Twitter, and recently on a local television station. Lisa knows that like her there are a lot of people who would like concise information on a topic in one digital location. Lisa is known for her simple and effective tips. 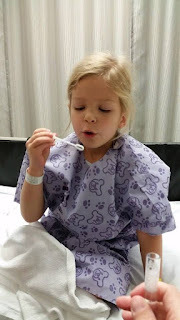 Six months ago my 4 year old daughter needed to get a 4 hours surgery at Geisnger Danville. 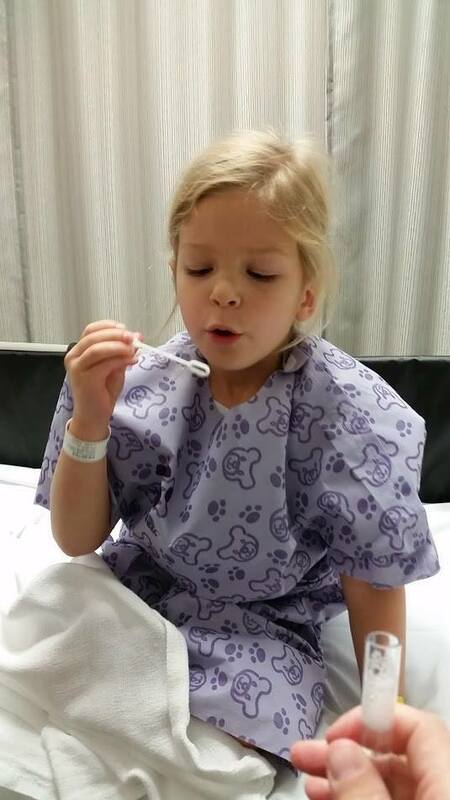 She needed to stay overnight after the surgery. After a long day and a successful surgery it was time to stay the night. When we got to out clean stark hospital room, there was a box waiting for us. 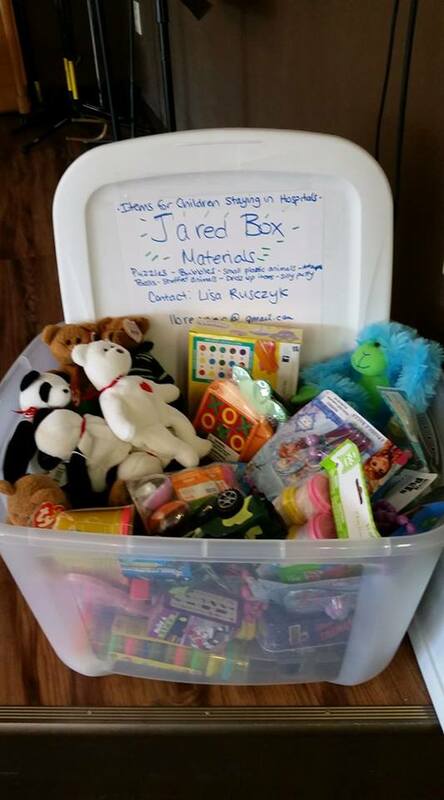 The box was called a Jared box and it was filled with toys and activities. The first thing my daughter said when she woke up was "Hello Kitty" because she saw there was one in the box. We played with the items in the box during our stay. We knew we were not alone that day. We knew other families have been there too and people outside of our own family were thinking of us. 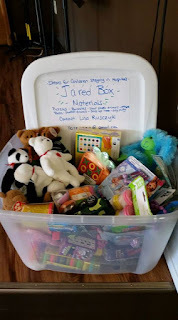 A few months later I decided to start a Jared Box project at our church. 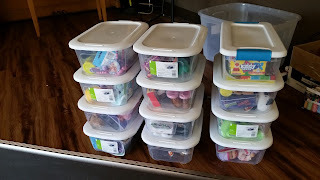 The first thing I did was buy 12 boxes for toys and one large box for donations. I decided that was going to be our goal and wanted to contribute by buying the boxes. Next I added the information to our church newsletter. I told them about the project, our goal, and what to bring. For the month of April, we will be collecting toys to place in shoe boxes to give to kids staying at children's Hospitals. 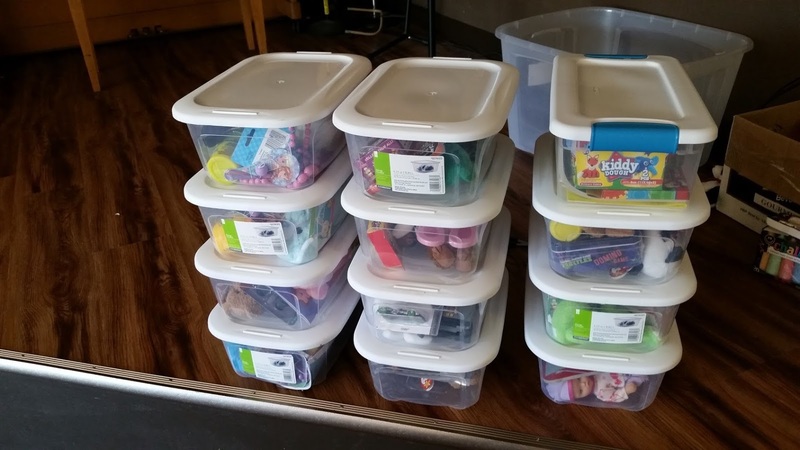 Children's Church will place them in boxes, and they will be delivered to Geisinger Children's Hospital. 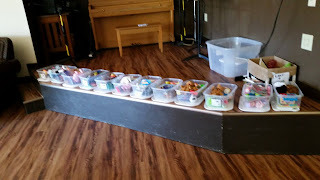 Suggested Items: Silly putty, play dough, paints, books, art supplies, bubbles, card games, puzzles, plastic animal figurines, cars, dress up toys, stuffed animals, stickers, and nerf balls. I also added similar info on social media. Remember to bring in your Jared box materials forThe Jared Box Project! We are collecting them for the month of April. The box is filling up already! Thank you for your donations. Well guess what. The box filled up!!! The next thing you could do is have a box filling party. I actually did it myself after sorting all the toys. The boxes were filled. All 12!! Our prayers were answered. I put all the boxes in a line and just started filling them. The next step was to get the labels on the boxes and decorate them. The kids did this during a bible study night while they had a sitter. They did a great job. Sorry I don't have a picture for that. The very last step is to deliver them to the hospital. I still need to do this step but it is one of the easiest. 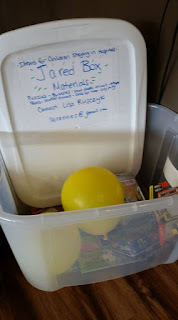 Find out more about the project here: Jared Box Project I wrote this blog post so you can get some ideas to start your own Jared Box project. Please let me know if I can help in any way by emailing me at lbrennec@gmail.com . Thank you to The Common Place Church for your help! Lisa Rusczyk is the founder of Charlie The Cavalier (a blog about Charlie her dog, and her friends, family and home) and founder of 50ThingsToKnow. Lisa is a Doctoral student in Educational Leadership who happened to start writing her first book 50 Things to Know Before Having a Baby after her little girl was born. Her book sold over 1,000 copies in the first year on Amazon. Today, she has over 10 books and helps others self-publish. Further, she shares this information with the public via this blog, Facebook, YouTube, Pinterest, and Twitter. Lisa knows that like her there are a lot of people who would like concise information on a topic in one digital location. Lisa is known for her simple and effective tips.